Kronomyth 1.0: Un poco burrito con salsa del Sul. These days, no one talks about the SHF Band anymore. It was a corporate move, a pot luck stew of minor stars and studio studs (Jim Gordon, Paul Harris, Al Perkins) that delivered the goods but didn’t give anyone chills. If you were looking for a supergroup with a cumbersome name (or just collecting albums with terrible covers), I’d point you to McGuinn, Clark & Hillman first, since that album had real hits and history behind it. 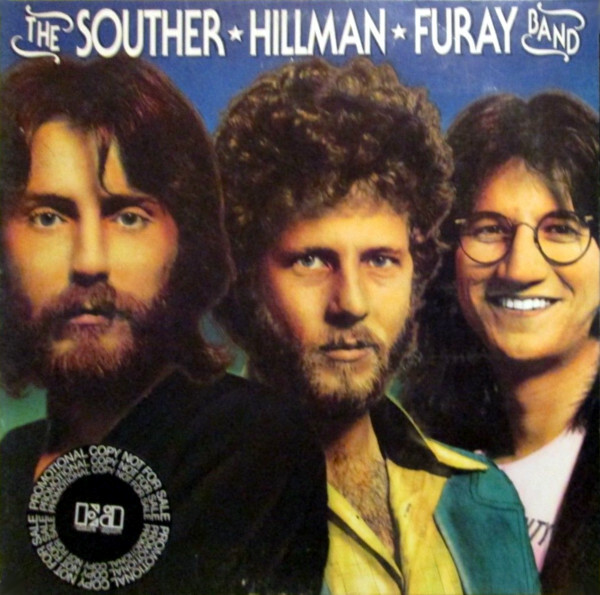 The personalities of Souther, Hillman and Furay never mesh on record, which in retrospect was part of the problem. This isn’t a band but three separate songwriters taking turns at the microphone; even the harmonies don’t click. As you dig deeper into the caves of country-rock, you’ll strike upon this record eventually, and there’s no harm done if you keep digging. For your troubles, you’ll get ten solid tracks that stack up well with the music these artists were making on their own (Down The Road, Slippin’ Away, Black Rose). I’ve always enjoyed Souther’s funkier cuts on here (“Border Town,” “The Heartbreaker”) and Furay’s “Believe Me,” for example. For the further adventures of SHF minus S and F, check out Hillman’s Slippin’ Away, which otherwise features the same backing band. Richie Furay (guitars & vocals), Chris Hillman (bass, guitars, mandolin & vocals), J.D. Souther (guitars & vocals), Jim Gordon (drums & percussion), Paul Harris (keyboards), Al Perkins (steel guitar, guitars, bass on A2, dobro on B3) with Joe Lala (percussion on A5/B3). Produced by Richie Podolor; engineered by Bill Cooper; mixed by Richie Podolor & Bill Cooper; direction by Elliot Roberts and Ron Stone. Album design, cover tinting & inside art by Jimmy Wachtel, assisted by Amanda Flick. Cover photography by Lorrie Sullivan. Released on elpee, quadrophonic elpee, cassette, 8-track and quadrophonic 8-track in July 1974 in the US (Asylum, 7E/EQ/TC-5/ET-8/8Q-1006), the UK (Asylum, K 53004), Australia (Asylum, AS 53004) and Canada (Asylum, 7ES-1006) with gatefold cover; reached #11 on the US charts. Re-issued on compact disc in 2002 in the US (Wounded Bird, WOU 1006). Re-issued on compact disc on July 6, 2018 in the UK (Man in the Moon).